By clicking on the settings icon at the top right of the Z1 Server screen you can access the settings dialog. The various options within that dialog are explained here. Note that your network needs to allow access across the IP address and port number that the Z1 Server software is using in order for a connection to be established between the Server and a client. If your anti-virus software or firewall, or any other system blocks traffic on the IP address or port number then a connection will not be able to be established. You can see the version number of the software on the left side of this screen. You can also see if you are running a demo version, or the type of registration you are currently using. The register/unregister buttons allow you to register or unregister the software. This drop down allows you to specify how the IP address the Z1 Server will use is determined. When this is set to Yes, then software will determine the IP address to use based on the IP address of the computer. If it is set to No then you will be responsible for entering an IP address for the software to use. Note that unless you have experience with networks, you should leave this option set to Yes. This is the IP address that the software will use. Note that if the Automatic IP drop down is set to yes, then you can leave this field blank. However, if that drop down is set to No, then you will need to enter the IP address you wish to use here. This is the port number that the software will use. By default port number 20900 is used. However you can change that if it is conflicting with another application. By default the Z1 Server software will calculate the the delta using its own data and broadcast that to the clients. This allows for accurate deltas in all of the sims. 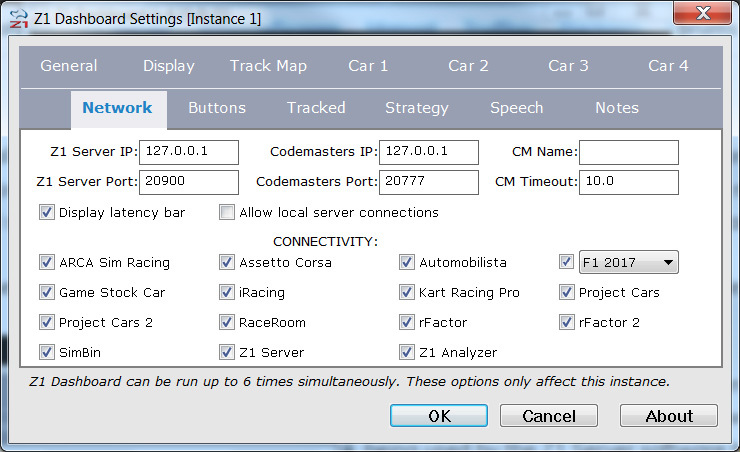 However some sims, such as iRacing and Assetto Corsa provide various deta options. You can specify that one of these should be used by the Z1 Server when running those sims. To do so, just select the desired option from the drop down. This option allows you to specify whether or not split times should be saved. Saving split times affects how the Z1 Delta is determined. If you save the splits them the system will save your fastest ever lap, and the delta will be calculated against that lap. If you do not save the splits then the delta will be calculated against the fastest lap of your current session. This determines when data logging is active. By default it is always active. However you can choose to have it activated using a button, or have it turned off. This determines where the ZOD telemetry files will be saved. The default location is in the documents/z1server folder. If you want to change that location click the Browse button and select the desired location. In order for the Z1 Dashboard to connect to the Z1 Server you will need to specify the correct IP address and port number. If you are running the Z1 Dashboard on a different computer from the sim and want to connect to the Z1 Server software, then you should enter the IP address being used by the Z1 Server software here. If this field is left blank then the Z1 Dashboard will not try to connect to the Z1 Server software.